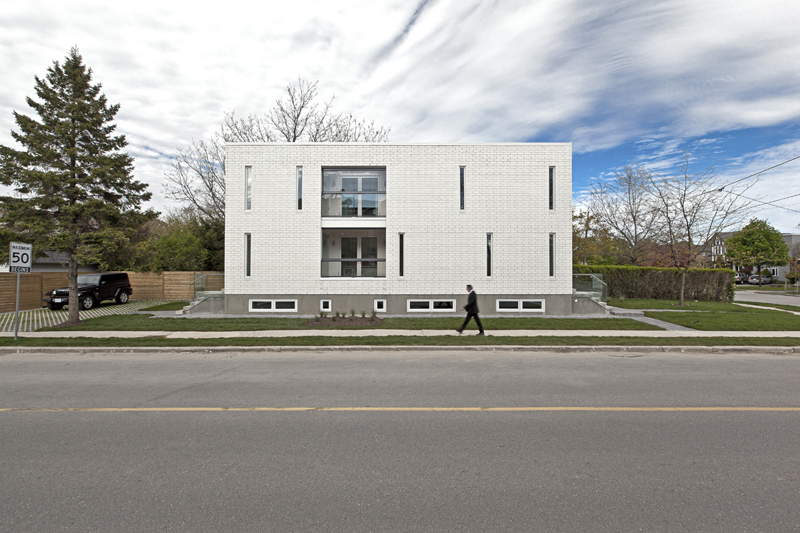 Patio House, located in the Nortown area in Toronto, Ontario, is a minimalist two-storey wood structure house, which carefully responds to three major questions: the needs of the residents, the situation of the site, and the environmental concerns. 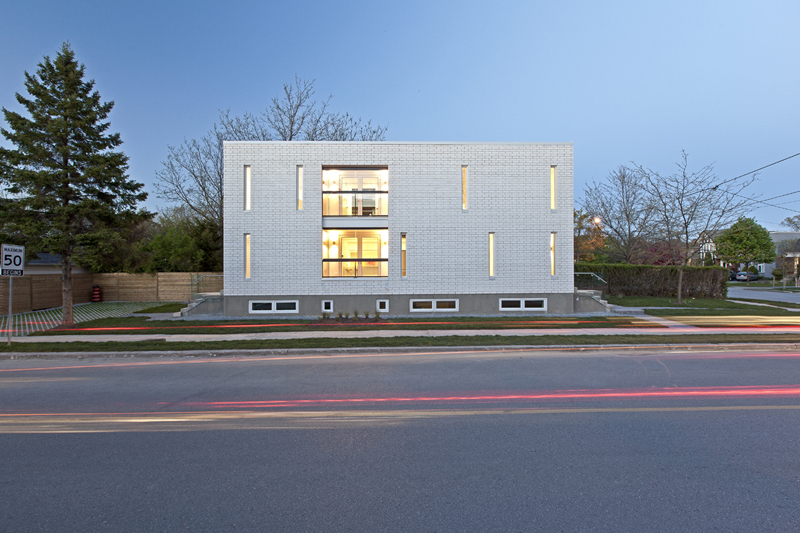 Being located in a corner lot, the building maintains a presentable façade for the residential street while controlling sun exposure from the west. 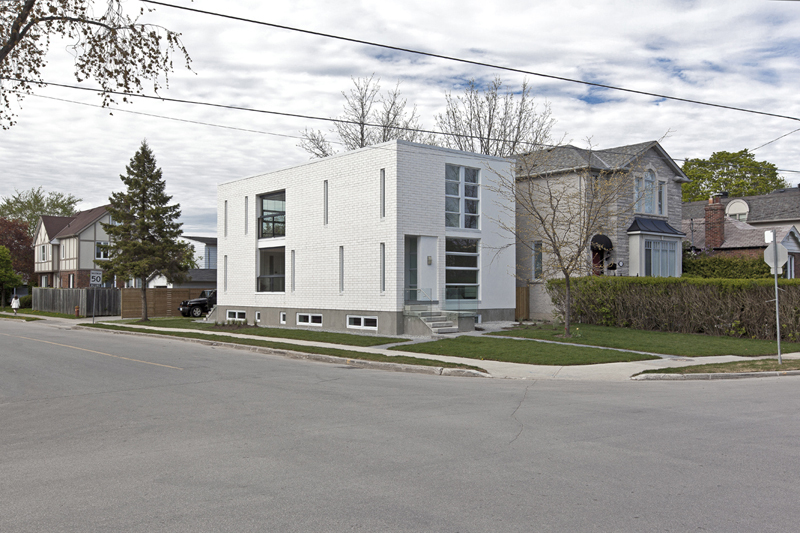 This strategy has been achieved by inserting a dynamic series of linear windows in the white brick façade and extracting a box from the monolithic geometry to create the patio. The patio acts as a buffer space between the west façade and the interior spaces of the house while allowing natural light to travel into the house and creating a visual connection between the interior divisions. 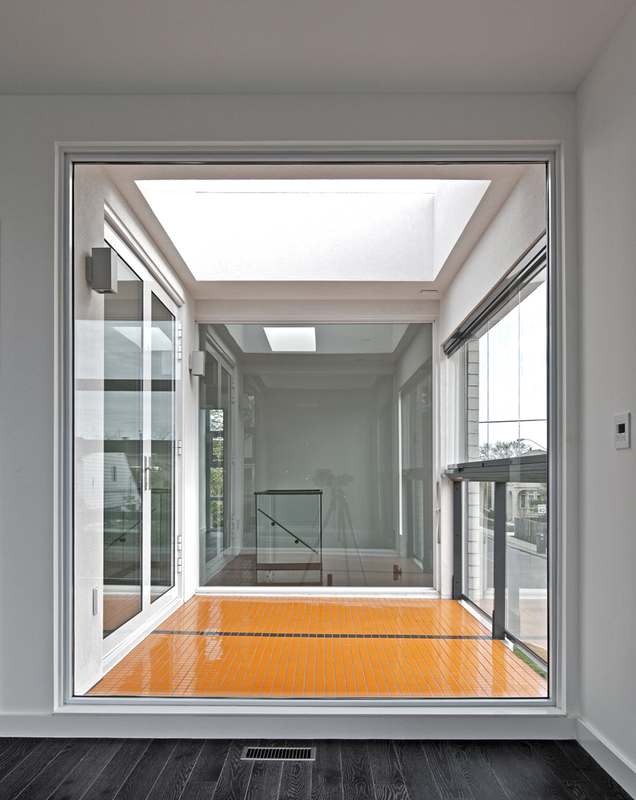 The operable glazing in the patio adds the area to the interior rooms of the house i.e. kitchen and family room on the ground floor and the master bedroom on the upper level. The patio zone blurs the edge between the exterior and the interior while creating an in-between situation in severe weather conditions of winter and summer times. It becomes a getaway from the conditioned air of inside and the severe temperature of outside leaving you to decide whether you are inside or outside of the house. On the ground floor a continuous airy space washed with natural light is divided into four public zones, which gradually become more private as it reaches the end of the house. A linear orange accent light on the ceiling responds to the orange tiles of the patio and the orange quartz backsplash of the kitchen decorating the interior of the house by emphasizing its continuous linear design and connection between the living room, the kitchen, and the family room. 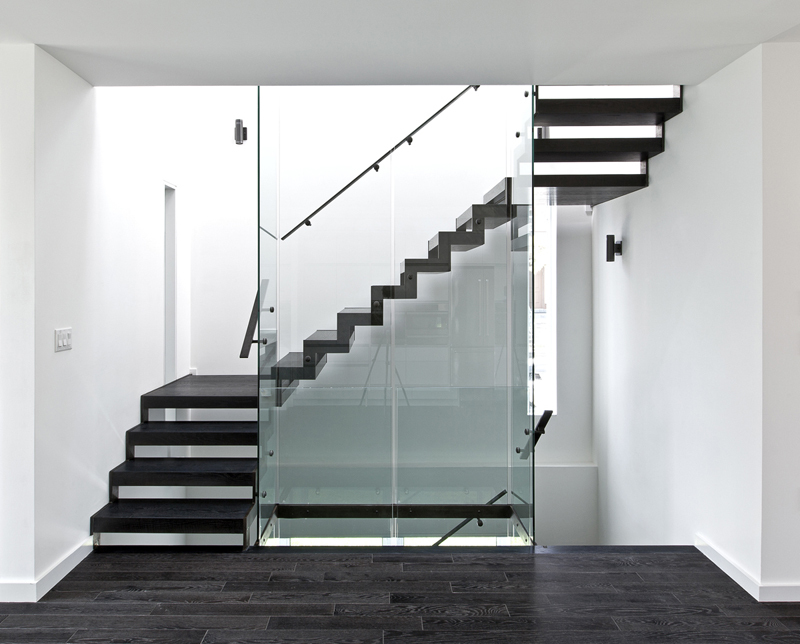 The entry foyers, service rooms, staircase and the patio are carefully stacked in a linear row to avoid any disturbance to the remainder of the house. 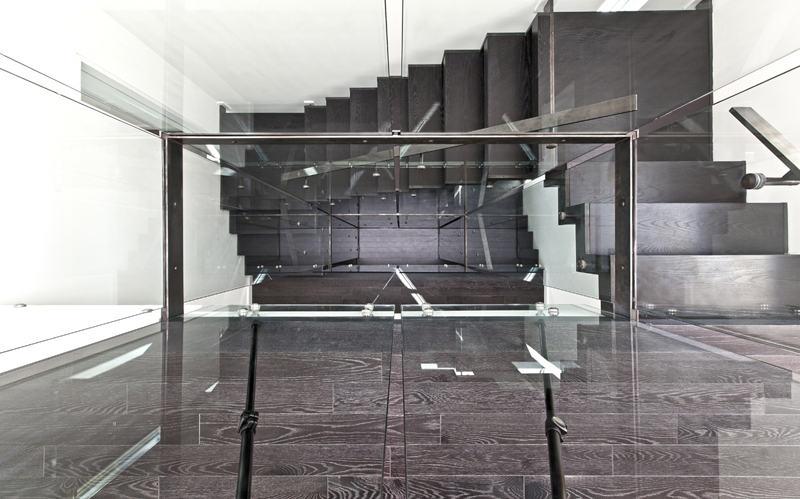 The detached staircase built by unfinished hot rolled metal sheets appears as a stand-alone sculpture and animates the space by creating a suspended movement experience throughout the house. 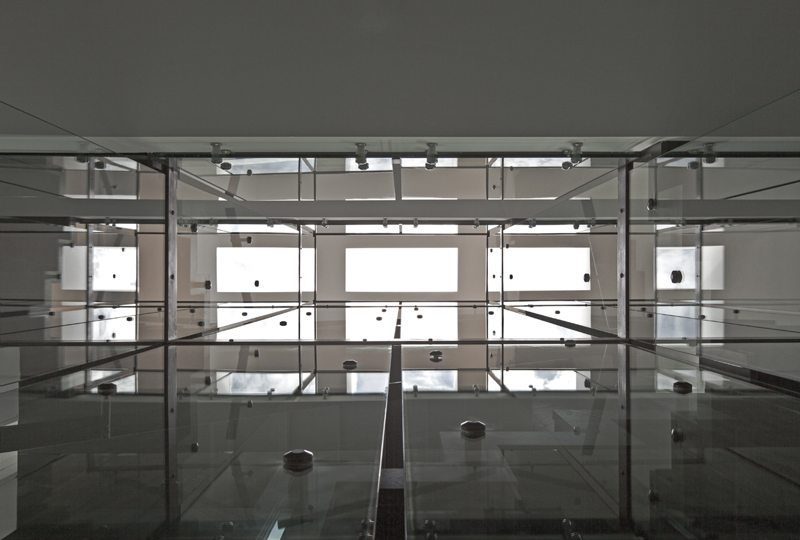 Tempered glass sheets circulating around the stairs travel towards the skylight in the ceiling where they discover natural light and carefully carry the dancing light to rest on the basement floor where it transforms into a soften blanket of light protected by hovering sheets of glass. The patio house is yet another manifesto of rzlbd’s obsession with voids and solids that narrate a living style, light wells that animate spaces, and spatial engagements that awaken minds.